King Richard the Lionhearted and his bodyguard of hand-picked knights. 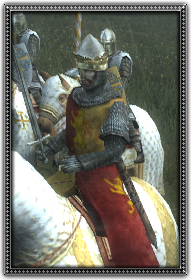 HERO ABILITY (HEART OF THE LION): Richard is such an inspiring leader that once per battle he can send out a tremendous call, rallying all his fleeing men on the battlefield! These men return to battle with a renewed hope and uplifted morale.